Despite the only reference being AWM 224 MSS 38 called the History of the 12th Regiment from its Formation on 1st March 1915 to date of embarkation to Australia it is written in such a manner as to indicate that the manuscript was written from first hand experience and so it included a section specifically related to the battle of Beersheba and is extracted below. Anonymous, History of the 12th Regiment from its Formation on 1st March 1915 to date of embarkation to Australia. On the afternoon of 28th. October the 4th. Brigade moved out to Esani and the following day continued the march to Khalasa. On the 30th, the Brigade accompanied by a Battery of H.A.C. Horse Artillery travelled by night across the desert and by a long detour arrived on the morning of the 31st, at a point approximately 9 miles North East of Beersheba. All that day the Brigade remained bivouacked under cover of the hills resting both horses and men in anticipation of heavy work ahead. At 4.p.m. the same day it was decided that the 4th. Brigade should attack Beersheba mounted, the horses being greatly in need of water. A hasty reconnaissance of the ground in front was made with a view of selecting a covered way of approach for the Brigade to the point of deployment. This was necessary as the 3rd. Brigade had just previously been heavily shelled in attempting to cross exposed ground. A. & B. Squadrons of the 12th, and two squadrons of the 4th. Regt., with one Squadron from each in support moved forward, all pack animals and Hotchkiss Guns being sent to the rear. On reaching the crest of a hill Beersheba about three miles distant could plainly be seen at the foot of the Beersheba Hills. Moving forward in line at the trot with drawn bayonets the men and horses eager for the fray, the pace soon increased to a gallop. As the first line of galloping horsemen neared the outer defences of the town it was noticed that many buildings were in flames, the enemy evidently attempting to destroy stores and works of military Importance. On topping the rise 800 yards in front of the enemy trench system, a terrific rifle and machine gun fire from a line of semi-circular trenches met the oncoming horses, emptying many saddles and filing many trusty steeds, but the line continued unchecked. On reaching the Trenches many horses whilst attempting to clear then were brought down, and others were impaled on enemy bayonets. The greater number of horsemen who successfully cleared the trenches or avoided them by veering to the right or left, galloped straight for the enemy guns, capturing them intact, then continuing the gallop entered the town which soon capitulated. The rapidity of the attack seamed to demoralise the enemy as they mostly fired high, and it was afterwards found that the sights of their rifles were never lowered below 800 metres. The enemy artillery was al so unable to estimate the pace, and the shells all went over the heads of the advancing troops. In the charge for the Trenches one Troop of "A" Squadron and portion of a Troop of "B" dismounted for action, and together with those who had been unhorsed, after a stiff fight were instrumental in collecting many prisoners. "C" Squadron in reserve, on finding that the Left flank of the Regiment was unguarded through a Yeomanry Regt failing to arrive in time, moved forward and filled the gap. It was now dark and great disorder prevailed in the enemy camp, armed and unarmed Turks were scattered about in small groups awaiting capture. By 10pm 1,080 prisoners, 9 guns, and 180 animals had been collected and placed under guard. In the meantime the Regiment had been reorganised and preparations made to resist a counter attack. Next morning after burying the dead and attending to the wounded, the work of salving all enemy abandoned war material commenced. 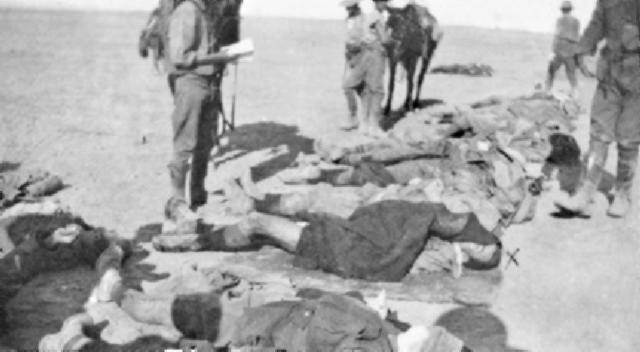 The casualties amongst men and horses although severe, were small compared with the task accomplished. The charge of two Light Horse Regiments mounted, armed only with bayonets, against a line of trenches fully manned by a formidable enemy and a nest of Machine Guns, is without parallel in the History of Warfare.